20111020 - Up worked, walked, finished work. 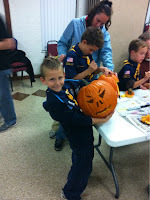 Had dinner with the fam and then played Battleship w/ J, then cards with J, then Scouts pumpkin carving with J. We worked together and got it done fast and it looked great. He got the award for the best fangs. J and I ran past Blockbuster on the way home. Boys to bed then I tried to install the BlueRay player, but was foiled... Watched world series, and a movie.